Q. Do you have a timeline of Ford Motor Company Assembly Plants? Ford Motor Company started building domestic assembly plants outside of Michigan in 1911, with the first assembly opening in Kansas City in 1912. The company continued to expand their domestic assembly operations, opening assembly operations across the country, until the Great Depression hit. 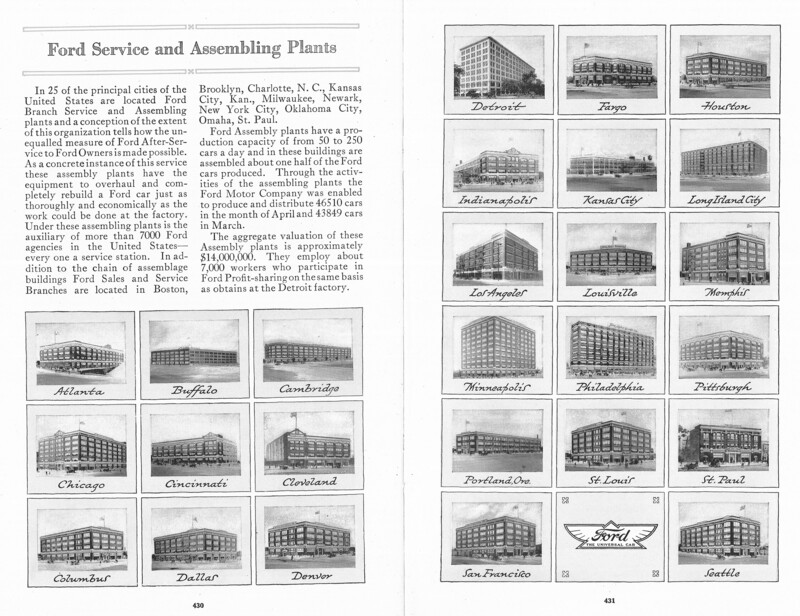 In 1932/1933 the company was forced to shut down all but seven of their 31 assembly plants outside Detroit, only nine of the closed plants reopened when the economy improved. No new assembly plants were built from 1932-1947 and then at least one new assembly was added each decade until the latest assembly was added in 1987. There are currently eight domestic assembly plants still in operation. Below is a timeline of Ford Motor Company’s domestic assembly plants. The timeline is arranged chronologically, listing under the year each plant location that began assembly that year. Many plants moved locations within the city, or relocated outside the city, in these cases the new location will be listed under the year it started assembly. For instance Chicago’s first assembly plant is listed under 1914, when assembly started, that building closed and the assembly plant relocated in 1924 so the new building is listed under 1924. At the bottom of the page is a bibliography of source material on Ford’s assembly plants available, and open for research, in the Benson Ford Research Center. Jackson Ave and Honeywell St.
Fairview Ave. and Valley St.
Baum Blvd and Morewood Ave.
966 S. Mississippi River Blvd.